Yan grew up in the town of Sukhumi in the former Soviet Union on the black sea. At age 12 his family moved to Charleston. He was enrolled at the West Ashley location of Masters Studios to adjust to American life. With his natural athleticism and high energy personality, Yan quickly became an instructor under Masters Studios co-founder Phil Beauregard in 1997. Currently a fourth degree black belt in Kempo Karate, Yan is the director and chief instructor of the North Charleston Masters Studios. 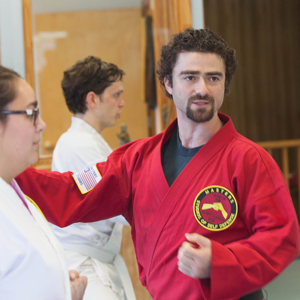 A large part of Yan’s martial arts philosophy and passion is guiding children and adults towards their unique and natural rhythm allowing them to do things they thought impossible a short time ago.